One of our chapter’s most active (and we hope effective) programs is called Truth in Military Recruiting, or TIR for short. This used to be called by many, Counter Recruiting, but we felt that had a bit too negative connotation for some consumers (e.g., school administrators) so we changed the title we use. The Linus Pauling Chapter visits Benton County, Oregon high schools several times per month, tabling during lunch to offer materials and information. Our philosophy behind TIR is to offer students the information and tools necessary to make an intelligent decision about a career in the military. We do not try to dissuade students who are already keen on joining. Although, we do offer ways to get out of the enlistment agreement should they have a change of heart before reporting to boot camp. It’s very understandable that students, without knowledge of the military system and lifestyle, not only do not know the answers, they don’t know the right questions to ask. They therefore fall victim to whatever a recruiter, uncle or TV ad might tell them about the glamorous life of a soldier, sailor or Marine. Students sign up for the military for a number of reasons: money for college, secure employment after high school, medical coverage, retirement benefits. But, if given a complete understanding of the provisions offered by the military, they might think twice. We value that second thought. This is a life-changing decision, in the truest sense, and it deserves careful consideration and, most importantly, the facts. The drop-down menu items in the TIR top bar menu above offer some web resources and other materials for use in TIR projects. These might include tabling at schools, classroom presentations and leafleting at events where recruiters tend to prey, with their glitzy, Madison Avenue, $7 billion per year Pentagon budget funded promotions, give-aways, battlefield video games, climbing walls and the like. 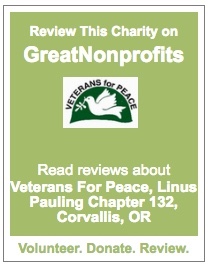 Please contact us at info[at]vfpcorvallis.org with questions or if you would like to volunteer in our TIR programs.